Wash the leeks, trimming off the roots and removing the outer leaves. Cut off the tough tops of the leaves and wash the leeks again carefully. Cut into thinnish slices. Saute in a little butter, then season with the sugar, lemon juice, and salt and pepper to taste. 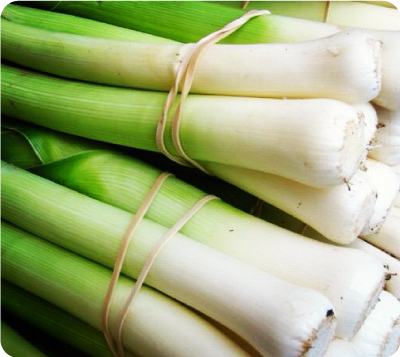 Let the leeks stew in their own juices until soft and lightly colored. Alternatively, the leeks can be washed and trimmed as above, then boiled in salted water until just soft, drained and chopped. Beat the eggs lightly in a large bowl. Add the leek mixture, mix again and adjust seasoning. Cook as usual, in a frying pan or in the oven, and serve cut in slices with a side salad. Not included in Large Kitchen Boxes: butter (included in 3-5 boxes), sugar, salt & pepper. By Adapted from Claudia Roden's "A New Book of Middle Eastern Food"